TRUCKEE, Calif. (KGO) -- A rare winter-like storm brought more snow to the Sierra Nevada on Monday, giving skiers the opportunity to enjoy the slopes as summer gets underway. At Squaw Valley, the storm dropped four inches of snow at the upper elevations and two inches at the base, delighting skiers and snowboarders who will be on the slopes past the Fourth of July for a first time in history. "It's definitely unique," Squaw Valley/Alpine Meadows resort spokesman Sam Kieckhefer said. "We are seeing bathing suits and costumes on the slopes. The skiing has definitely been extremely festive." The plan is to open the slopes every summer Saturday as long as the snow holds out, he said. "We anticipate this could last through July and even into August," Kieckhefer said. The wicked winter that socked California is also keeping Mammoth Mountain ski resort open into August. Monday's snow was helping that effort. About an inch of snow was recorded on Mammoth Mountain itself between Sunday and Monday morning, while two locations in Kingvale logged 5 and 6 inches of snow, National Weather Service meteorologist Mike Kochasic said. Snow in June is rare but not unheard of, Kochasic said. "I'm seeing a lot of zeros here in (past) climate records for June," he said. "It definitely doesn't happen every year. It's infrequent." Tire-chain restrictions have been lifted Monday for many Sierra roads, but lingering rain and snow is expected in the western Sierra Slopes, at Lassen National Park and along Interstates 50 and 80 and at high-elevation campgrounds and trails. In much of northern Nevada, high temperatures on Monday were as much as 25 degrees below normal. In Reno on Sunday, the temperature was 56 degrees. 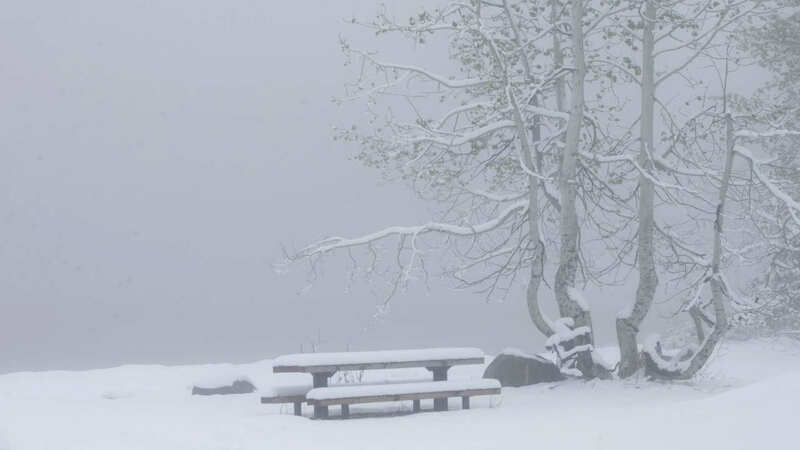 Four inches of snow was reported on the top of the mountains near Lake Tahoe. The northeast corner of Nevada remained under a winter weather advisory until 11 p.m. Monday, with anywhere from 6 inches to a foot of snow possible at the highest elevations. The high on Monday was expected to top out at 61 in Reno. That compares with a high of 92 degrees a week ago. The forecast calls for steady warming into the 60s Tuesday, upper 70s Wednesday and back into the 90s by the end of the week. Elsewhere, high winds in Utah toppled semis on Interstate 80 near the Nevada border as the mercury dropped. Highway Patrol troopers were turning back high-profile vehicles like semis and RVs on a stretch of I-80 starting about 70 miles from the Nevada border. Though the highest winds were reported in the west desert and Great Salt Lake, 30-mph gusts were also reported in the Salt Lake City area as an unusual cold front moves through, according to the National Weather Service.